An integrated robotic system offers an ideal solution for businesses that have a requirement for speedy loading and unloading of machinery.To maintain a high standard of efficiency during production, our Robots will load and unload machinery accurately and quickly. With a continuous supply of raw materials, the robot will keep the machine busy, even on round the clock shifts. Safety is paramount when dealing with heavy machinery such as injection moulding equipment or gear grinding machines, by using a robot you can reduce the danger to personnel and increase productivity. Handling of materials for warehousing is another perfect choice for automation. From paper sacks of chemicals to heavy machine components bricks, our Robots will stack pallets without damage and at a speed. With machine loading applications being so diverse we at ERL can offer a large selection of robots to cover a wide range or customer requirements.The products we offer can be engineered into Interpress, Injection Moulding, N C Machines and other machine loading applications varying from 1kg to in excess of 200 kg. 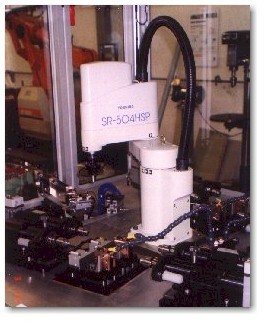 If the system requires a robot we have the product to be applied.